#20 – The Exterminator by Auerhahn Press (1960). An Installment in Jed Birmingham’s series of the The Top 23 Most Interesting Burroughs Collectibles. 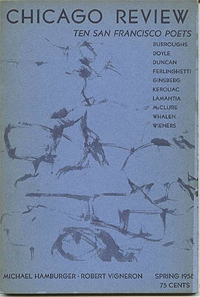 In 1958 on the cover of the Spring issue of Chicago Review, William Burroughs headlined a list of “Ten San Francisco Poets.” At the time, Burroughs had never been to San Francisco nor did he consider himself a poet. Contemplate. While thinking about this Beat koan, which I do rather often (and in case you think I am weird in that regard, note that Oliver Harris has mused over it as well), I am always reminded about how much I love the alternative publishing scene of California, particularly that of San Francisco, from the late 1950s into the 1960s. For my money — and, well, collecting is how I spend most of my money besides on cigars and beer #addictivepersonality — the Mimeo Revolution began on the West Coast. The Mimeo Lexington and Concord occurred at the printing facilities of the Waldport internment camp during World War II, where conscientious objectors shot off the publications of the Untide Press in the face of the official camp organ Tide Press. The alternative press has always gone against the current and opposed current events. Things exploded into an all-out media war in 1957 in the wake of the Howl trial and publicity surrounding On the Road with the publication of issue two of Evergreen Review. 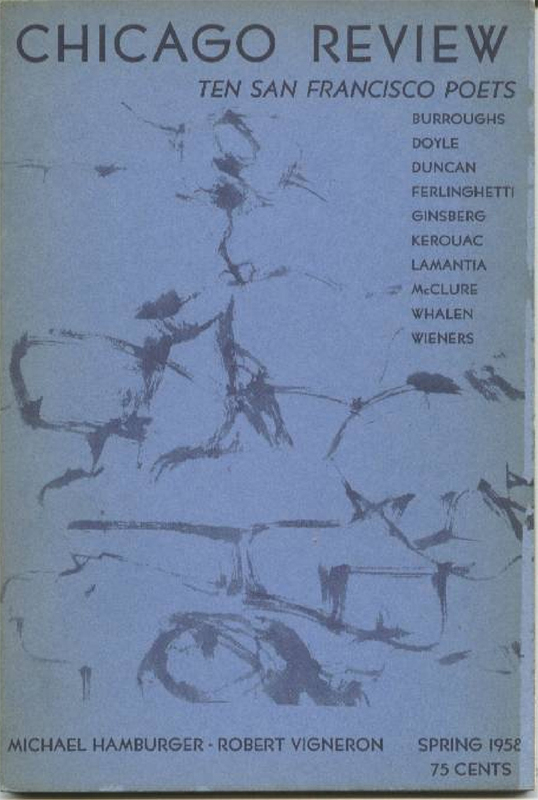 Despite what the Chicago Review suggested, at no time was Burroughs a part of any of this, nor was he included in the great SF mimeos of the late 1950s, like Beatitude or Jack Spicer’s J. For example, no matter how much I would have loved Burroughs to have crossed paths with Spicer bibliographically, it was not to be. Maybe Rainer beer and eukodal do not mix. The two men would surely have hated each other, if only because Spicer hated everybody, particularly those, like Burroughs, who represented privilege. Nor did Burroughs appear in the publications of White Rabbit Press or Open Space, two of my favorite alternative publishers on the West Coast. Well, that is not completely true: Stan Persky of Open Space parodied Burroughs and Yage Letters. But the exception proves the rule. Burroughs was not welcome by many in San Francisco. His dark humor and paranoid vision did not socialize well with a poetry infused with crisp sunlight and fresh sea air. Think Gary Snyder or Philip Whalen. The reaction to Burroughs was like that to The Velvet Underground when they accompanied The Plastic Exploding Inevitable in the City by the Bay in 1966. Yet Burroughs and The Velvets were prophets of doom. By the late 1960s, speed and heroin would wreak havoc on a California counterculture once based on pot and LSD. And remember, before the publication of Yage Letters, Lawrence Ferlinghetti of City Lights wanted nothing to do with Burroughs and declined to publish Naked Lunch when it was offered to him back in the 1950s. Again this makes my point all the more clear: Burroughs was not a San Francisco Poet and those poets generally did not want his company. As with Spicer, the feeling was no doubt mutual. So Burroughs was not a San Francisco Poet except for that gloriously odd moment in 1960 when he suddenly and awkwardly was. 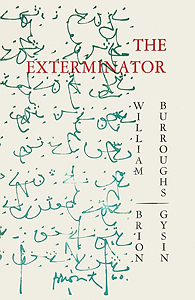 I am talking about the publication of Burroughs and Gysin’s The Exterminator by Dave Haselwood’s Auerhahn Press. For me, Auerhahn Press is the crème de la crème of the West Coast alternative presses, so it is a California dream to see Burroughs included on Haselwood’s backlist. That said, it was a bit of a nightmare for Haselwood. Like many readers, Haselwood was blown away by Naked Lunch and he offered to publish anything Burroughs sent him based on that initial enthusiasm. Expecting more Dr. Benway, Haselwood received the manuscript for The Exterminator instead, which is an admittedly odd jumble. In essence a cut-up manifesto, it is Burroughs at his most Dada and in it, as in Minutes to Go, which was published in the same year, Burroughs reads like, you guessed it, a poet. At first glance, Burroughs may not seem like a San Francisco Poet, such as Duncan, Ferlinghetti, or Everson, but if as Burroughs would say, you take a broader view, Burroughs fits right in what was going on in California Art circles: junk art, assemblage, collage, and proto-Pop. If Haselwood was crestfallen when he read the manuscript Burroughs and Gysin sent, the Don Quixote and Sancho of the cut-up could not be more optimistic. In their eyes, The Exterminator was going to be a bestseller and the start of a profitable relationship with Haselwood. Burroughs and Gysin were not just high on themselves or something else in thinking this. Again their optimism goes back to California Art in some ways. Junk art, assemblage, collage and California Pop were, in 1960, about to explode on the public consciousness. The 1961 Art of Assemblage show at MOMA showcased in lavish fashion precisely the techniques of montage, collage, and assemblage that Burroughs was incorporating into his writing. More importantly for Burroughs and Gysin, the art of assemblage, which was being practiced from Paris to LA, was selling in galleries and to institutions. In this light, it becomes understandable how Gysin and Burroughs could say with a straight face to Dave Haselwood of Auerhahn Press that The Exterminator would “catch on commercially” or how the Dream Machine would hit the mass market. A lava lamp or pet rock for expanded consciousness. For a brief period, in the early 1960s, the climate of the art market made such pipe dreams possible. 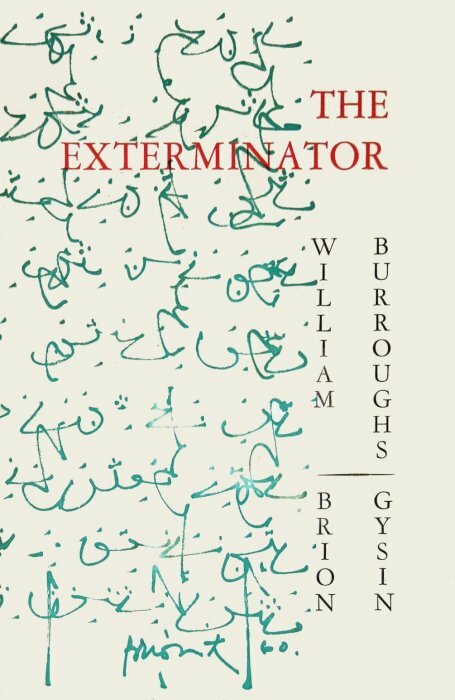 [A] typographic lapsus: The Exterminator by William Burroughs and Brion Gysin, whose innovations in prose have seldom been paralleled in the typography of their books. Haselwood does approach the coranto immediacy of the later Brion Gysin Let The Mice In (Something Else Pres, 1973, designed by Graham Mackintosh), though Exterminator strikes out towards an oversize Olympian paperback. The running commentary in Grotesque points up the blackness of the text, however the unletter-spaced Cloister capitals detract from the appearance; the murky Venetians indicate Haselwood’s Kelmscott tendency. How I would love to see an essay on Burroughs’ typography!! Wonder if there is enough there to make a go of it. According to Johnston, probably not (although Burroughs apparently believed that “letterforms would go back to hieroglyphs, similar to the ancient Egyptians“). 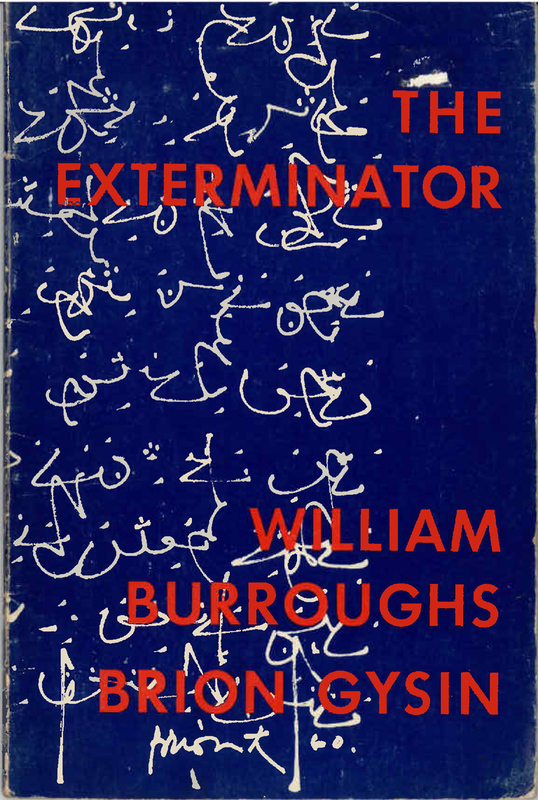 In any case The Exterminator deserves to be read, but even if one chooses to ignore it on that level, it should still capture one’s attention as an object and as an example of quality printing. Although again some like Alastair Johnston disagree, I find The Exterminator to be one of my favorite items from Auerhahn Press. I absolutely love the cover design and the use of color. Internally it is typographically interesting, if confused. The use of a text header would be recycled by Richard Aaron in his catalog five twenty years later. As Johnston points out, The Exterminator is a paperback in the tradition of Olympia Press, which means just about everything to me. This brings us to one of the central tenets of William Burroughs collecting. Paperbacks are always more desirable than hardcovers. 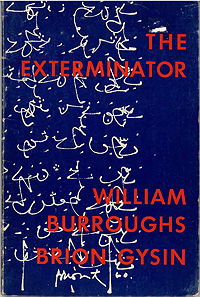 The first five or six A items of Burroughs’ bibliography are must-haves not so merely because of their contents, great has they are, but because they are paperbacks published by alternative presses. The rise of the Mimeo Revolution parallels the Paperback Revolution and the brief ascendance of the independent bookstop. For me, hardcovers are tainted by ties to corporate publishing and in collecting, as with restaurants, the corporate is to be avoided at all costs. Like all that is great in art, the paperback is disposable, recyclable, useful and ephemeral. Yet not so much like fast food, as farm to table. The best of Burroughs’ bibliography is in this vein. The Auerhahn Exterminator is located at the high end of the paperback spectrum: the fine press of the Mimeo Revolution. The best collectibles belong not on bookshelves or sequestered in the climate controlled backrooms of institutional libraries – although that is always where they end up and die – but in the knapsacks and back pockets of hitchhikers who follow Kerouac on the road. They should be pulled out and enjoyed on road trips, not read in reading rooms. Hardcovers are designed by focus groups and in corporate boardrooms; the design of paperbacks are created on the fly next to mimeograph machines and letterpresses. Of course this is a myth as there is nothing more corporate than the mass market paperback, but some myths, like the myth of an endless frontier in America and its illusionary atmosphere of creative freedom and free speech are too just good and too pure to let facts get in the way. The best Auerhahn publications can be appreciated both on the road and on display. Dave Haselwood was a Pecos Bill of alternative publishing, a larger-than-life figure, and although neither pure poetry nor from San Francisco, his Exterminator feels right at home as a highspot of 1960s Left Coast publishing. And as such it demands pride of place in my book collection. Written by Jed Birmingham and published by RealityStudio on 29 November 2015. How I would love to see an essay on Burroughs’ typography!! There is no doubt in my mind that his early publishers were quite out of their depth when it came to realising his typecripts to the printed page – no wonder the small presses who were not constrained by the corsets old letterpress printers wore became so inspired …. Girodias did his best I think, but Calder, Cape and even Grove just exploited Burroughs.